Chiefly British variant of B.C.D.. "P.C.D." stands for "Pitch Circle Diameter" but "B.C.D." ("Bolt Circle Diameter") is preferable, because the term "pitch circle" has a different meaning when speaking of sprockets. A special braze-on with a slot to hold the end of the reaction arm of a hub brake to the chainstay without the need for a clamp or bolt. This makes removing and replacing the rear wheel of a bike with a hub brake considerably easier. I believe this was first used on Santana tandems. A bag that hangs alongside one of the wheels of a bicycle. Panniers usually come in pairs. Well-equipped touring cyclists often use two pairs, one on the rear, the other on the front, for better weight distribution. If front panniers are mounted so that the top of the pannier is below the top of the wheel, they are "low riders." Contrary to popular belief, "pannier" is not a French word, and should not be pronounced as one. The normal English pronunciation is: "PAN-yer". "Pannier" is, in fact derived from a French word: "panier", a basket (more specifically, a bread basket, from "pain", the French word for "bread." A pantograph is a 4-bar/4-pivot mechanical linkage that is used to copy designs, sometimes in different sizes. 2 of the corners are fixed, the tracing point is on one of the movable corners and the engraver is on the other. If the 4 arms are all the same length, the copy is the same size as the stencil, but by varying the arm length you can make a pantograph enlarge or reduce graphics. A pantograph with an engraving tool is commonly used to engrave names in bicycle parts. High-end bikes, particularly Italian ones, sometimes have the frame builder's name "pantographed" on the handlebar stem, cranks/chainrings, lugs, etc. The word "pantograph" is sometimes used to refer to the parallelogram linkage of a derailer, though this usage is not strictly correct. A parallelogram is a four-sided geometric form, in which opposite sides are of equal length. A rectangle is a parallelogram in which the angles are 90 degrees. A parallelogram linkage with pivots at the four corners allows the angles to change as it flexes, but the facing sides always remain parallel to one another. This is a very useful mechanism for derailers, because it allows the derailer cage to move sideways while remaining parallel to the chain, and without the friction that would result from a sliding motion, as used on older plunger-type**** derailers. This type of linkage is also used in some V brakes to provide a more nearly horizontal motion to the brake shoe, and to keep the shoe angle constant. A major randonnée held every 4 years, a mass ride from Paris out to Brest on the tip of the Brittany peninsula and back, total 1200 kilometers, (750 miles) stopping only for meals and catnaps. This is widely considered the most challenging non-racing event in cycling. To be eligible to ride in major randonnées, a rider must qualify by riding a series of shorter randonnées called "brevets". A spring-loaded part that engages a set of teeth when moving in one direction, but slides over them when moving in the other direction. The pawls in a freewheel make a ticking sound when a bicycle coasts. Most freewheels have two or three pawls. A single-ended socket wrench with a flat handle, particularly the Campagnolo 15 mm wrench made for tightening crank fixing bolts and track nuts. The name derives from the fact that racers on a tight budget would often have to make due with peanut-butter sandwiches while on the road, and in the absence of kitchen facilities, they would use the handle of this wrench to spread the peanut butter on their bread. The part you put your foot on. The axles of the pedals screw into the cranks. The right pedal has a normal thread, but the left pedal has a left (reverse) thread. Plain pedals rely on the rider's coordination to keep the foot properly located on the pedal. This type of pedal is most popular with beginner or unsophisticated riders, who fear being unable to put a foot down in a hurry. Clipless pedals, which provide a positive connection between the shoe and the pedal, without the constriction of straps. Some clipless shoe-pedal systems have protruding cleats, while others have recessed cleats so the shoes are walkable. The Pedals and Shoe-Pedal articles on this site give more detailed information. A densely packed group of riders, sheltering in each others' draft. In a mass-start race, most of the competitors usually end up in one large peloton for most of the race. The word is French, from a term that means rolled up in a ball...a related word, peloter, means to caress sensually, cuddle. A high-wheel bicycle. This term comes from old British coinage, where the penny was a very large coin, the farthing a very small one. Very old-established American manufacturer of bicycle saddles. The synchronization of a tandem's cranks. Most tandems are set up so that the cranks are "in phase", that is to say, that the pilot's and stoker's pedals go up and down together at exactly the same time. Tandemists sometimes like to experiment with different phasing of the cranks. One alternative is "90 degrees out of phase", where one set of cranks is horizontal while the other is vertical. This produces a smoother power flow, although it is a debatable whether this matters. Out-o- phase cranks complicate high-speed cornering, since both riders cannot have their cranks horizontal at the same time. It is the spirit who likes in-phase cranks." Some tandemists prefer a setup that is only slightly out of phase, typically with the pilot's chainwheel one or two teeth ahead of the stoker's. See also my article on Tandem Synch Chains. A California-based maker of very high quality bicycle parts. Phil Wood is best known for hubs, which were the first modern cartridge-bearing hubs, using large diameter axles that never bend or break. Many cyclists consider these hubs the finest available. Phil Wood also makes cartridge-bearing bottom brackets assemblies. These are used with separate rings that are available in a wider variety of threadings than those of any other manufacturer. For some obsolete bottom bracket threading systems, Phil Wood is the only current product that will fit. The company also supplies an excellent grease and oil. The Phil Wood spoke machine is an all-mechanical machine that cuts and threads spokes to any desired length in a single operation, by simply pulling a lever. This machine is in a class by itself. Formerly, Phil Wood also made pedals and one of the first disc brakes ever designed for bicycles. These products were less successful than those mentioned above. The disc brake, in particular, is considered quite dangerous by some. It was prone to fracture of the disc, causing abrupt, total brake failure, with no warning. There are no parts available for the disc brakes. They were designed an asbestos-based disc, and the use of this material for brakes is no longer legal. Slang term for a disc-type chainguard. A pillow block is a solid piece of metal with a semi-circular groove in it, intended to clamp a round shaft or bearing. The major bicycle application for pillow blocks is for handlebar stems . Most decent-quality BMX bicycles use pillow-block type stems, another term for what is known as a "pop-top" stem. The front rider of a tandem, also called "captain" or "steersman". When a round part is held inside another round part, but adjustability is desired, the outer part will often have a slot or gap. This gap will be bridged by a bolt that can squeeze or "pinch" the outer part so that it will clamp onto the inner part. Such a bolt is called a pinch bolt. Most bicycles use pinch bolts to secure the seatpost into the seat tube of the frame, and to secure the handlebars to the stem. Threadless stems usually use pinch bolts to secure the stem to the steerer. 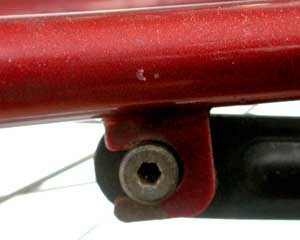 Many tandems use pinch bolts to secure their eccentric bottom brackets. 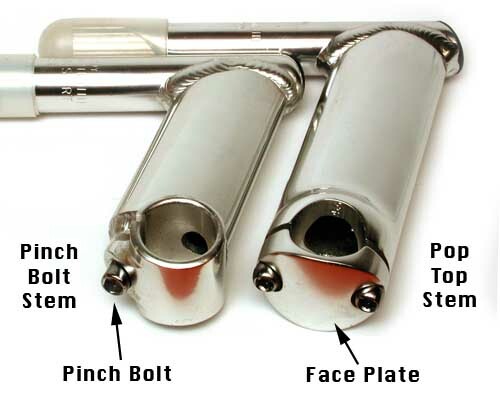 The bolt may fit through "ears" that are attached to the outside of the outer part, or it may close the gap of a split collar which surrounds the upper part of the seat tube. A few older bicycles used a collar and pinch bolt to secure a handlebar stem inside of the steerer. 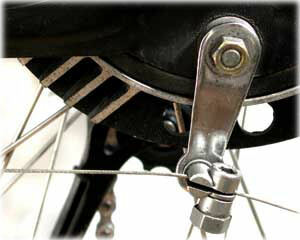 This system is particularly common on folding bicycles to allow the use of a quick-release for the handlebar stem. This system required a compression slot to be cut into the steerer, and the slot could constitute a stress riser. Modern chainrings intended for derailer use commonly have special features on the sides to improve upshifting . These are pins, usually riveted to the sides of the larger chainrings, and ramps cut or stamped into the inboard sides of the chainrings. These pins and ramps help catch the chain to climb from a smaller to a larger chainring. The smallest chainring will usually not have these features, because you never upshift to the smallest ring. The protruding rivets of older chains would catch in the space between chainwheel teeth. Modern chains for narrow sprocket spacing have rivets that do not protrude, and so the pins on the chainwheels take on the task of lifting the chain. Steel pins are used in aluminum chainrings for improved wear resistance. The pins do the actual lifting of the chain, and take the most stress. The ramps just provide a smooth path for the chain to climb once it has been lifted by the pins. Hyperglide-type rear sprockets have similar ramps, but don't need pins, because the sprockets are of hardened steel. These features help improve shifting, and make rider skill less important in shifting, but none of these features is actually essential to the functioning of any system. A hole in an inner tube caused by getting the tube pinched between the rim and a hard, sharp object, such as a rock, curbstone or the edge of a pothole. Pinch flats (also known as "snakebites" because there are usually two small holes in the tube, as if made by the fangs of a snake) are usually caused by carelessness or riding under-inflated tires. They can also be caused by the use of a tire which is too narrow for the weight it is asked to carry. If the tire is too soft, or too narrow, it is easy for it to bottom out when striking an obstruction. Rim damage also may occur, loosening spokes and possibly causing a rim brake to grab. If the tire is hard enough and plump enough to carry the weight, the air will keep the tube from being pinched between the rim and the road hazard. The pitch of a chain is the distance between adjacent drive rollers. All modern bicycles use 1/2" pitch. Some older chains, especially those used on track bicycles used 1" pitch chain (see skip link and block chain.) For a while, Shimano experimented with a 10 mm pitch for track use, but it never caught on. Sometimes people mistakenly refer to "track pitch" vs. "road pitch" when they are really referring to the wider (1/8") sprockets used on single-speed bicycles, instead of the 3/32" thick sprockets used on derailer-equipped bicycles. 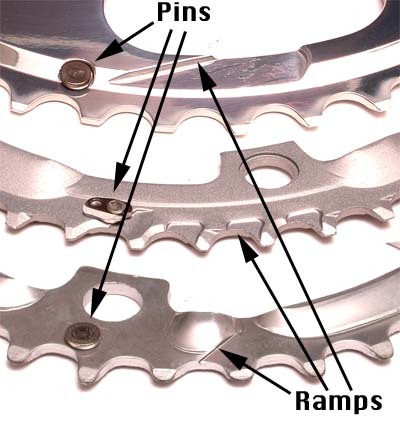 An 8-tooth sprocket for 1" pitch chain (left) is equivalent to a 16 for standard 1/2" chain. The pitch of a nut or bolt is the distance between threads. S.A.E. fasteners have the pitch specified in terms of how many threads there are per inch (T.P.I.). Metric threads are specified by the distance between threads, in millimeters. The pitch circle of a sprocket refers to the diameter of a circle drawn through the centers of the rollers of a chain wrapped around the sprocket. Damage to a metal surface that takes the form of one or a series of small craters or pits in the surface. This is a type of failure often seen in worn-out bearing cones. A planetary gear train consists of a stationary "sun" gear, surrounded by several (usually 3 or 4) identical "planet" gears which mesh with it. The planet gears, in turn, mesh with a hollow "gear ring" which has teeth on the inner surface. The gear ring rotates faster than the planet gears. If the drive sprocket is connected to the gear ring, and the cage that holds the planet gears is used to turn the wheel, the wheel will turn slower than the sprocket, thus providing a lower gear, compared with a simple hub driven by the same-sized sprockets. If the drive sprocket is connected to the planet cage, and the gear ring drives the wheel, the result is a higher gear. Most three-speed internally-geared hubs use these two configurations, along with the direct drive. to provide the three speeds. Internally-geared hubs with more than three speeds use multiple sun pinions and sometimes multiple planet gears in the same manner. See also my articles on English 3-speeds and internal-gear hubs. Plastic deformation: permanent deformation which occurs when a material is stressed beyond the yield point (the limit below which it springs back to its original shape) -- that is, becomes bent. Plastic deformation of spokes is important to relieve them of bending stress when building a wheel. Plastic materials: The word is defined in Wikipedia: "A plastic material is any of a wide range of synthetic or semi-synthetic organic solids that are moldable." Bicycle water bottles and parts of some bicycle components have long been made of plastic materials. In the 1970s and 1980s, a couple of attempts were made to market bicycles with frames of plastic materials reinforced with glass fiber, but these frames were heavy, bulky, flexible and noisy: their large surface area worked as a sounding board. More recently, the very high stiffness of carbon-fiber-reinforced epoxy materials has enabled the manufacture of very lightweight (though fragile) frames and forks. Cyclists who prefer metal frames use "plastic" as a derogatory term for carbon-fiber bicycle frames and components. A pedal intended for use with toe clips and soft-soled shoes. Platform pedals are usually single-sided, and intended exclusively for use with toe clips. One side has a large flat surface to support the rider's foot, spreading the pressure over a wide area for comfort. The other side usually has only the structural support ridges that hold the platform, and is not intended to be used for pedaling. The best known platform pedal was the French Lyotard "Marcel Berthet" model 23, one of the most elegantly designed bicycle parts ever. Platform pedals have superior ground clearance compared with double-sided pedals, and provide easier, faster entry to the toe clip than other styles. There is a tendency to misuse the term "platform pedal" to refer to plain pedals that have no provision for holding the foot in place. A scissor-like gripping tool that multiplies the strength of a user's hand. Designed for grabbing irregular-shaped objects. Pliers have very limited use for bicycle work, and many bicycle parts are damaged by incompetents who try to use pliers for a job that really calls for a wrench. This commonly results in damage to the surfaces of the nuts or bolts so abused, as the serrated jaws slip around. Many accidents are caused by people attempting to secure axle nuts with pliers. This cannot be done by people of normal hand strength, the nuts will not be tight, and the wheel is liable to fall out. Never use pliers to tighten nuts or bolts! Locking pliers, such as Vise-Grips ® can grip a nut or bolt hard enough, but will ruin the driving surface so that it will be unusable with the correct tool. A tire inflated with air, as opposed to an airless tire. In general usage, "pneumatic" refers to any device which operates by air pressure. Although there have been bicycles specifically designed for bicycle polo, the term is most commonly used as a synonym for "wheelie bike"
A handlebar stem with a removable face plate, usually held on by two or four bolts. (Also known as a "Pillow-Block" stem. Pop-top stems permit much easier stem removal/replacement, because they permit the handlebar to be detached from the stem without removal of grips, tape or brake/shift controls. Most newer bikes come with this type of stem. The "pop top" design also lighter and stiffer. Traditional aluminum stems are forged or cast, and the horizontal section is solid. The horizontal section is kept relatively thin to keep weight down, but as a result it's less stiff than might be desired. A system of running the front brake cable through the stem wedge bolt so that the cable will not hang up when the handlebars and fork are rotated. Used on freestyle bicycles. See also rotor. Most other indexing systems place the detents in the control lever. A SRAM trademark for a special master link which can be disassembled without the need to press out a rivet pin, making it easier to clean the chain. A Power link also will work with other brands of chain, though it has been reported that problems can occur with thin chains made for 9-speed cassettes. For 10-speed chain, with its thin side plates, SRAM makes the PowerLock, good for one-time use only. As bicycle brakes have improved in recent years, there has arisen the perception that some front brakes are "too good" as if such a thing were possible. As a result, some manufacturers have taken to adding devices that deliberately sabotage the functionality of the front brake, out of fear that an unskilled rider will take a header as a result of improper use of the front brake. These sabotage devices are commonly called "power modulators" and sometimes are marketed as if they were a version of ABS braking as used on newer cars. This is a very foolish approach, probably driven by the common superstition that the use of the front brake is inherently dangerous. The result is increased stopping distance. This is a "safety" feature that is actually more likely to be a detriment to safety. See also my article on Braking and Turning and John Allen's advice in Bicycling Street Smarts. "Power Ratchet" is an advertising buzzword for a Sun Tour design, that decouples the shift lever from the friction clutch when shifting in the direction that pulls against the derailer's return spring. With a pure friction lever, the friction has to at least equal the maximum pull of the derailer spring. When these are close, it takes almost no effort to push the lever forward (loosening the cable and the spring,) because the spring is helping you push the lever forward. However, when you pull backward on the lever, tightening the cable, you are working against both the resistance of the friction clutch in the shift lever and the spring tension. This creates an asymmetry of lever force between upshifting and downshifting. With a "Power Ratchet" system, the ratchet disengages the friction clutch as you pull the lever backward, so you're only working against the spring. This gives a notably nicer feel to the shifter. Other brands have solved this problem different ways. Shimano used to use a spring in the shifter that opposed the derailer's spring. This avoided the slightly "granular" feel created by the ratchet. The legendary Simplex "Rétrofriction " levers did something similar, using a pawl-less ratchet. As a result, the Simplex design didn't have the "micro clicks" of the Sun Tour design. "Precession" refers to the tendency of a part subject to rotating stresses to rotate in the opposite direction of the stress rotation. In bicycle applications, this becomes a particular issue with the threads that hold pedals into the crank, and the threads that hold the bottom bracket assembly into the frame. See the Pedals entry in this Glossary, and Jobst Brandt's article on Left Hand Threads on this site for a detailed explanation of precession. An initial load on a part, which is independent of the load it is designed to bear. Bearings are commonly supplied with a slight pre-load, that is, they are made to be slightly tighter than would permit the freest possible motion. This is to prevent slop in the bearing, and to ensure that the stresses are shared by multiple balls or rollers. Some suspension parts, particularly suspension stems and seatposts, are designed with an adjustable pre-load. This is adjusted so that in carrying the rider's steady-state weight, the part is pressed up against a stop, so that it doesn't bounce up and down with minor road irregularities or body movements. When a more serious bump is hit, the suspension will respond to the greater load thus applied. Small changes in tire pressure can have major effects on the ride quality and performance of a bicycle. It is best to experiment with different pressures to find out what works best for your particular combination of tire width, weight and surface conditions. Tire pressure is much more important than, for instance, frame material in determining how your bike will ride. For details, see the article on Tires on this site. See also the article on Flat Tires on this site. The narrow valve used on most high-performance bicycles, and all tubulars. Also known as a "French valve". The wider Schrader (automotive style) valve is used on children's bicycles and utility bicycles. Presta valves have built-in valve caps, which must be opened before you can pump them up. These caps are "captive" nuts, which cannot be removed. Since there is no spring in a Presta valve, this knurled nut must be retightened after inflating the tire, or the valve may leak slowly. Presta valves are light, and don't require as large a hole in the rim. Since the don't use a spring, they can be easier to pump with a hand pump. There is a third type of valve, very rarely seen in the U.S., which has a bottom similar to a Schrader and necks down to about the size of a Presta. This is a Woods valve, formerly popular in the British Isles and Asia. These low-tech valves work with rubber tubing and spit. This is also sometimes referred to as a "Dunlop" valve. If you want to convert a rim drilled for Presta valves to accept Schrader valves, drill it out with a 21/64" drill bit. A tandem has at least two chains. The primary chain is the final drive chain that runs to the rear wheel, usually from the rear bottom bracket. The primary chain is similar to the chain on a solo bicycle. In paceline riding, the riders usually take turns riding in front, allowing the others to draft behind them. The rider in front is "taking a pull", pulling the others along in his or her slipstream. A common measurement of tire pressure. These tools are also more formally known as "extractors." Bicycles use pulleys both for chains and for cables. Most rear derailers use two pulleys in a spring-loaded cage to regulate the tension of the chain as it runs over different sized sprockets. The upper pulley is called the "jockey" pulley, the lower one is the "tension" pulley. ...apply extra tension and guidance to prevent accidental derailment on downhill bicycles. Pulleys have traditionally been used on 3-speeds to lead the cable where it crosses the seat tube, either at the top (following the top tube/seat stay) or the bottom (following the down tube/chain stay) of the seat tube. Many early '90s mountain bikes used a pulley at the bottom of the seat tube, to permit top-pull cable routing with bottom-pull front derailers. Since top-pull front derailers became readily available, this system has been obsolete. Accessory cable pulleys, such as the Avid Rollamajig ® are sometimes used in place of the traditional loop of cable housing where the cable enters the rear derailer. ...for centerpull/cantilever rear brakes on ladies' bicycles, where the cable has to make a sharp bend after it runs up the back of the seat tube. Eccentric pulleys are sometimes used to change the mechanical advantage of a cable. This is most commonly done to permit the use of direct-pull cantilevers with conventional levers. A type of track racing for two cyclists or two teams, who start 180 degrees apart on the track. The race ends when one rider or team passes the other, or, after a fixed number of laps, with the victory going to the rider or team who has gained on the other.